This is a ‘whatever-is-on-my-countertop’ salad. Granted this photo has been sitting in my docket since a time when beautiful Connecticut peaches were in season, perhaps it can be a bit of inspiration for those of us getting cold and cranky in the pre-winter weather. Don’t let the time change get you down; even though it’s dark at 4:30, there is no need to crawl under the blanket with a microwaved dinner when you get home. Make a bright and cheerful salad to lighten your day. Lentils are satisfying, hearty, and chock full of nutrients, while walnuts, renowned for their satiating quality and powerful antioxidants, help boost your mood. Avocados are also known to elevate spirits. 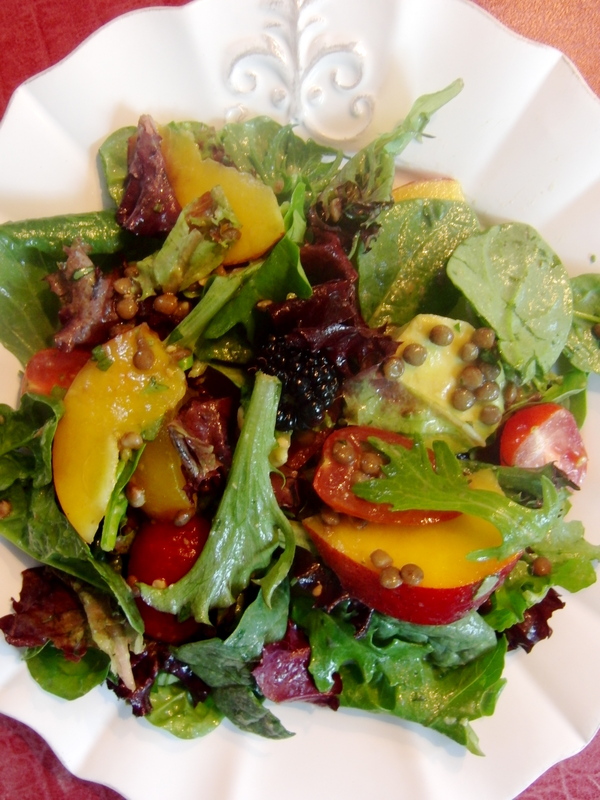 Substitute beautiful acorn squash or apple wedges for the peaches. Dress with a simple lemon juice, olive oil, and Dijon mustard vinaigrette, and you’re back under the blanket. Rely on winter thermals from Patagonia to keep you warm, not pesky layers of skin.